Find a Baseball at Goodwill and Instantly Win! On August 25 & 26 visit a participating Goodwill Store & Donation Center in Wisconsin and find a baseball hidden somewhere inside the store. 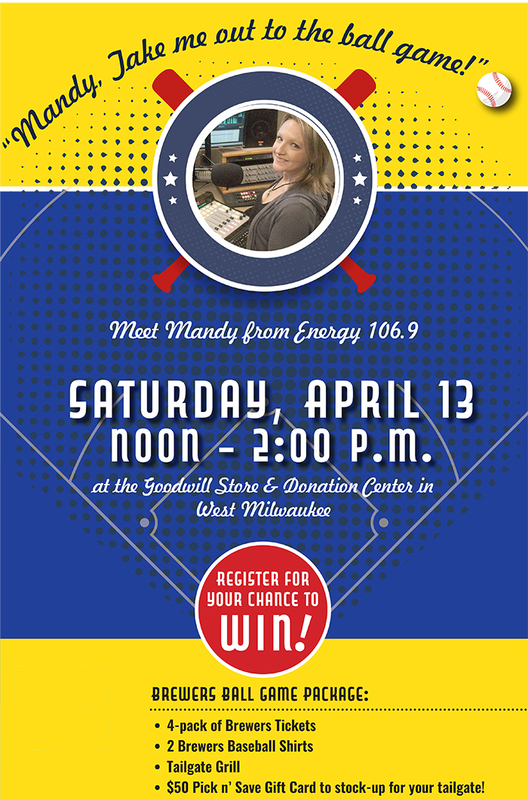 Then, bring the baseball to the check-out register (purchasing the baseball is not required) to instantly win one (1) official Milwaukee Brewers cap, and register to win a Grand Prize – First Pitch Experience! Club Goodwill REwards Members Get Half-off Select Brewers Tickets! You already know that being a Club Goodwill REwards member has its perks! In addition to extra discounts and great savings in our Goodwill Store & Donation Centers, we've got a special promotion just for you. ... For a limited time only you can now purchase tickets to the Brewers vs Pirates game at Miller Park on Septenber 20th and September 22nd for HALF OFF! You already know that being a Club Goodwill REwards member has its perks! In addition to extra discounts and great savings in our Goodwill Store & Donation Centers, we've got a special promotion just for you. As a Club Goodwill REwards member, you'll receive 50% off select ticket locations for one of two Brewers home games this season. Club Goodwill Members - Buy One Brewers Ticket, Get One Free!